Education and the overall promotion of drumming in our community are extremely important to Gretsch Drums. We do our best to help support as many events in this area as we can each year. In order to ensure everyone has the most successful events possible, Gretsch Drums has put together the following information outlining our education policies and procedures. The basic thing to remember is that the party initiating the clinic is responsible for making all necessary arrangements. TERMINOLOGY: Gretsch: Within the following, "Gretsch" is "Gretsch Drums," a division of Drum Workshop, Inc.
Clinician: Within the following, "Clinician" indicates an artist on the official Gretsch roster. The Gretsch endorsement and clinician rosters are separate. An Endorser must apply to the Clinician Program to be an official Clinician. Host: Within the following, "Host" is the person hiring the Clinician and is, thereby, the employer. A Host of a clinic or festival is typically a music store, a school, or independent festival promoter. Definition: Private Lessons are individual teaching sessions with one student at a time. Booking: Clinicians normally schedule and conduct Private Lessons out of their own home or studio. If a Host has contacted Gretsch to request a Clinician for an in-store Private Lesson, Gretsch will forward their information to the Clinician so that the two parties can negotiate the booking together. Gretsch is not set up to act as a booking agent for Private Lessons. Travel Expenses: The Host of the Private Lesson is responsible for paying any travel expenses associated with their hiring of a Clinician. This typically includes: flights, hotel, meals, and ground transportation. The Host is responsible for booking all travel as negotiated with the Clinician. Fee Payment: Students typically pay a flat fee for Private Lessons. The Host of a Private Lesson may require a portion of the students' fee in exchange for providing lesson space. It is up to the Clinician to negotiate his/her entire fee and specific terms with the Host. Since the Clinician is being paid his/her fee by the students (either directly or via the Host), Gretsch does not contribute financially to Private Lessons. Promotion: The Host is responsible for promoting their Private Lesson properly. This typically includes: customer mailing, local newspaper, radio, in-store signage, flyers and handouts. Because Gretsch does not contribute financially to the Clinician's fee for Private Lessons, we feel it is inappropriate for us to gain promotional value by sending giveaways when other parties are paying the expenses. Our policy is to only send giveaways if we are contributing financially. Invoicing: The Clinician is responsible for invoicing the Host or students directly. Gretsch does not contribute financially to Private Lessons. Definition: A Master Class is a small group lesson (typically 10-20 people) where students pay admission to the Clinician for "private" instruction within the group setting. A Drum/Music Camp is a group lesson over the course of one or several days where the student pays admission to the camp for the cost of the lesson, plus food and/or accommodation expenses as required. Some private instruction may also occur. Master Classes/Camps usually focus on a specific topic (rudiments, playing to a click, etc.) that can be demonstrated and taught within a classroom-type agenda. Unlike Clinics, there is very little, if any, Clinician performance. Booking: Clinicians (or their Managers) are free to book Master Classes/Camps directly with a Host. If a Host has contacted Gretsch to request a Clinician for a Master Class/Camp, Gretsch will forward their information to the Clinician so that the two parties can negotiate the booking together. Gretsch is not set up to act as a booking agent for Master Classes/Camps. Travel Expenses: The Host of the Master Class/Camp is responsible for paying any travel expenses associated with their hiring of a Clinician. This typically includes: flights, hotel, meals, and ground transportation. The Host is responsible for booking all travel as negotiated with the Clinician. Fee Payment: Students typically pay admission for Master Classes/Camps. The Host of a Master Class/Camp may require a portion of the students' admission in exchange for providing lesson space. It is up to the Clinician to negotiate his/her entire fee and specific terms with the Host. Since the Clinician is being paid his/her fee by the students (either directly or via the Host), Gretsch does not contribute financially to Master Classes/Camps. Backline: The Host is responsible for arranging drums, hardware, cymbals, PA system, playback, handouts and any other materials required for the Master Class/Camp. The Host is also responsible for providing or hiring a tech. Clinicians must provide their rider to the Host at least six (6) weeks prior to the Master Class/Camp in order for the Host to prepare. If the Host is a retail store, they will provide equipment from the store based on the rider, though sizes and configurations may sometimes vary slightly according to stock on hand. The Clinician will be as flexible as possible, but if he/she requires specific gear that the Host does not have available at the store, the Host must contact Gretsch immediately to purchase the additional items. If the Host is a school or other venue where drums, PA, etc. are not readily available, the Host is responsible for contacting a backline company to obtain the appropriate items. Gretsch works with several backline companies all over the world, which allows our Clinicians access to Gretsch gear, typically at no rental cost. A listing of these Gretsch-affiliated BACKLINE COMPANIES is available on our website. Any cartage and preparation fees, charged at the backline company's discretion, are to be paid by the Host, as illustrated in each Clinician's endorsement contract. Gretsch cannot provide equipment for Master Classes/Camps from our factory. In the instance that a Gretsch-affiliated backline company is not available in the Host's area, other arrangements will need to be made through the Host. Promotion: The Host is responsible for promoting their Master Class/Camp properly. This typically includes: customer mailing, local newspaper, radio, in-store signage, flyers and handouts. Because Gretsch does not contribute financially to the Clinician's fee for Master Classes/Camps, we feel it is inappropriate for us to gain promotional value by sending giveaways when other parties are paying the expenses. Our policy is to only send giveaways if we are contributing financially. Invoicing: The Clinician is responsible for invoicing the Host directly. Gretsch does not contribute financially to Master Classes/Camps. Definition: A Clinic is a mixture of Clinician performance and instruction, with the majority of the presentation focused on instruction. An average attendance of 50+ persons per Clinic is expected. The Host of a Clinic is allowed to charge admission in order to offset their expenses. They may, however, chose not to charge admission at their discretion. In order for Gretsch to help support a clinic, it must be a specific solo drum clinic with a teaching agenda. Clinics are not mini concerts featuring the Clinician or the Clinician's band. CLINICS: ONE-OFFS Definition: One-Offs are clinics initiated by either a Clinician or Host (as opposed to specific CLINIC TOURS initiated by Gretsch). One-Offs can be one single clinic or clinic tours booked by the Clinician or their Manager. Booking: Clinicians (or their Managers) are free to book One-Offs directly with a Host. If a Host has contacted Gretsch to request a Clinician for a One-Off, Gretsch will forward their information to the Clinician so that the two parties can negotiate the booking together. Gretsch is not set up to act as a booking agent for One-Offs. Likewise, Gretsch is not able to book One-Offs around a Clinician's band tour or other travel. If a Clinician is already travelling to an area and wishes to do a One-Off while he/she is in town, they are certainly welcome to arrange that directly with a Host. A list of potential Hosts, searchable by location, can be found on our AUTHORIZED GRETSCH DEALER LOCATOR. Travel Expenses: The Host of the One-Off is responsible for paying any travel expenses associated with their hiring of a Clinician. This typically includes: flights, hotel, meals, and ground transportation. The Host is responsible for booking all travel as negotiated with the Clinician. Fee Payment: The Clinician is responsible for negotiating his/her fee directly with the Host of a One-Off. The Clinician must tell the Host the total fee he/she is requesting. Do not automatically discount any amount that is assumed to come from co-sponsors. It is the responsibility of the Host to contact the co-sponsors for potential contributions to offset their total cost. The Clinician (or their Manager) will indicate their full price and give a list of co-sponsor contact information, including Gretsch, to the Host. The Host will then contact Gretsch to request a financial contribution by filling out our online support request form. This form must be submitted at least four (4) weeks prior to the scheduled date of the One-Off. Upon receiving the support request form, Gretsch will send confirmation back to the Host indicating we would like to be a co-sponsor and the amount we will be contributing towards the Clinician's fee. Gretsch will always pay our portion directly to the Clinician. The Host will subtract our confirmed amount from the Clinician's total fee and pay him/her the remaining amount. If for any reason Gretsch is unable to be a co-sponsor and contribute financially towards the One-Off (lack of at least four weeks notice, budget restraints, account status, non-Gretsch dealer, etc. ), the Host would be responsible for the Clinician's entire fee, minus any contributions they are able to obtain from other co-sponsors. Gretsch does not require that we are the only sponsor for a One-Off. Backline: The Host is responsible for arranging drums, hardware, cymbals, PA system, playback, handouts and any other materials required for the One-Off. The Host is also responsible for providing or hiring a tech. Clinicians must provide their rider to the Host at least six (6) weeks prior to the One-Off in order for the Host to prepare. Gretsch cannot provide equipment for One-Offs from our factory. In the instance that a Gretsch-affiliated backline company is not available in the Host's area, other arrangements will need to be made through the Host. Venue: The Host is required to secure a proper venue to accommodate the stage and expected attendance. If the Host's store, school auditorium, etc is appropriate according to the Clinician's expectations, it can serve as the venue. Otherwise, the Host is responsible for renting a suitable hall for a One-Off. Promotion: The Host is responsible for promoting their One-Off properly. This typically includes: customer mailing, local newspaper, radio, in-store signage, flyers and handouts. If Gretsch is a confirmed co-sponsor, it is required that our name and/or logo appear on all printed and promotional materials associated with the One-Off. Once the support request form is received and Gretsch is confirmed as a co-sponsor, we will add the One-Off to the CLINIC CALENDAR page of our website. Gretsch will also send a clinic pack, consisting of Gretsch literature and door prizes, to the One-Off location listed on the support request form. If for any reason, Gretsch is unable to be a co-sponsor on a specific One-Off, we feel it is inappropriate for us to gain promotional value by sending giveaways when other parties are paying the expenses. Our policy is to only send giveaways if we are contributing financially. Invoicing: The Clinician is responsible for invoicing the Host and Gretsch (and possibly any other co-sponsors involved in accordance with their individual policies). In order to receive Gretsch's portion of his/her fee, the Clinician must submit an invoice within 60 days after completing the One-Off. Gretsch will issue payment for clinics within 30 days of receiving the completed invoice form. Definition:Clinic Tours are a series of clinics initiated by Gretsch in order to promote Clinicians, specific products, our image and to reward Authorized Gretsch Dealers. Gretsch determines the agenda, region and Clinician for each of these planned Clinic Tours before the start of every year. The criteria for determining which Clinic Tours Gretsch will conduct each year includes: budget, product focus/new launches, Clinician ideas, Host requests, etc. Another main consideration is repetition; in an effort to be fair to Hosts and Clinicians alike, Gretsch avoids repeating the same Clinicians and regions each year. Since all Clinic Tours must be previously established within the year's budget, it is not possible to plan impromptu Clinic Tours on top of what Gretsch is already committed to each year. If a Clinician wishes to book his/her own Clinic Tour, they are absolutely encouraged to do so. This would fit under the heading of a ONE-OFF. Booking: Gretsch is responsible for booking Clinic Tours by coordinating the schedules of the Hosts and Clinicians. Gretsch hires the Clinician as an independent contractor in the case of Clinic Tours. Travel Expenses: Gretsch is responsible for paying any travel expenses associated with their hiring of a Clinician. This typically includes: flights, hotel, meals, and ground transportation. Gretsch is responsible for booking all travel as negotiated with the Clinician. Fee Payment: Gretsch is responsible for negotiating the fee per clinic directly with the Clinician. The Clinician must tell Gretsch the total fee he/she is requesting. Do not automatically discount any amount that is assumed to come from co-sponsors. It is the responsibility of Gretsch to contact the Hosts and co-sponsors for potential contributions to offset their total cost. The Clinician (or their Manager) will indicate their full price and give a list of co-sponsor contact information to Gretsch. Gretsch will then contact the potential co-sponsoring companies to request a financial contribution. Backline: Clinicians must provide their complete rider to Gretsch at least six (6) weeks prior to the first date in the Clinic Tour in order for everyone to prepare. Gretsch will forward the rider to each Host. In most cases, the Host is a retail store and they will provide equipment from the store based on the rider, though sizes and configurations may sometimes vary slightly according to stock on hand. The Clinician will be as flexible as possible, but if he/she requires specific gear that the Host does not have available at the store, the Host must contact Gretsch immediately to purchase the additional items. Sometimes the Clinician's drums are able to travel with the Clinic Tour. In this case, it is Gretsch's responsibility to arrange transportation of the gear. The Host is responsible for arranging cymbals, PA system and playback equipment in all cases. Venue: The Host is required to secure a proper venue to accommodate the stage and expected attendance. If the Host's store, school auditorium, etc is appropriate according to the Clinician's expectations, it can serve as the venue. Otherwise, the Host is responsible for renting a suitable hall for a Clinic Tour. Promotion: Gretsch is responsible for promoting their Clinic Tour properly. Gretsch will provide each Host with in-store signage and flyers prior to the event. We will also add the Clinic Tour information to the CLINIC CALENDAR page of our website and send a clinic pack, consisting of Gretsch literature and door prizes, to each location on the Clinic Tour. National print advertisements and other such promotions are at the discretion of Gretsch. The Host is additionally responsible for local promotions. This typically includes: customer mailing, local newspaper and possible radio spots. Gretsch will let the Host know the list of co-sponsors involved in the Clinic Tour. It is required that all co-sponsors'' names and/or logos appear on all printed and promotional materials associated with the Clinic Tour. Invoicing: Gretsch will pay the Clinician his/her entire fee and then invoice the Host and co-sponsors for their contributions to be paid to Gretsch. Some co-sponsors may prefer to pay the Clinician their contributions directly, in which case, the Clinician is responsible for invoicing said co-sponsors in accordance with their individual policies. In order to receive Gretsch's portion of his/her fee, the Clinician must submit an invoice within 60 days after completing the Clinic Tour. Note: As often as possible when scheduling permits, a Gretsch representative will travel with the Clinician and act as tour manager/tech for the Clinic Tour. It is Gretsch's responsibility to arrange this as part of our booking the Clinic Tour. Definition: A Clinician's performance at a Festival or Drum Event is typically more like a concert. In most instances, the Clinician is a solo act, but may sometimes invite a band to play with him/her. Unlike Clinics or Master Classes, there is little to no instruction (unless specifically requested by the Festival/Event Host). An average attendance of 200+ persons is expected. The Host of a Festival/Event normally charges admission in order to offset their expenses. They may, however, chose not to charge admission at their discretion. The following guidelines pertain to the five events listed above only. All other independently produced Drum Festivals and Events not listed above (including PAS Days of Percussion, Retail Shop Events, Vintage Shows, International Music Festivals, etc.) fall under the category of a ONE-OFF. Booking: Gretsch may only suggest Clinicians and does not have the final say as to who will be selected to perform. Generally, a Host will send their specific Clinician requests to Gretsch for Festivals/Events. From there, Gretsch is responsible for booking the Clinician (and potentially their band, if previously approved). Gretsch hires the Clinician as an independent contractor in the case of Festivals/Events. Fee Payment: Gretsch is responsible for negotiating the fee directly with the Clinician. The Clinician must tell Gretsch the total fee he/she is requesting. Do not automatically discount any amount that is assumed to come from co-sponsors. Backline: Clinicians must provide their complete rider to Gretsch at least six (6) weeks prior to the Festival/Event in order for everyone to prepare. Gretsch will forward the rider to the Host. 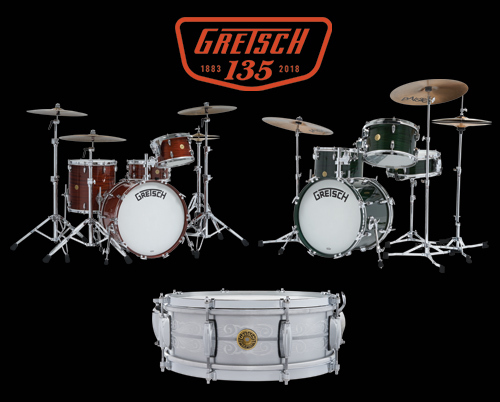 Gretsch is responsible for providing any items produced by Gretsch. The Host is responsible for arranging all non-Gretsch items (PA system, playback equipment, guitars, amps, keyboards, etc). Venue: The Host is required to secure a proper venue to accommodate the stage and expected attendance. If the Host's store, school auditorium, etc is appropriate according to the Clinician's expectations, it can serve as the venue. Otherwise, the Host is responsible for renting a suitable hall for a Festival/Event. Promotion: The Host is responsible for promoting their Festival/Event properly. This typically includes: customer mailing, magazine ads, local newspaper and possible radio spots. Gretsch will let the Host know the list of co-sponsors involved per Clinician. It is required that all co-sponsors' names and/or logos appear on all printed and promotional materials associated with the Festival/Event. Additionally, Gretsch will list the Festival/Event information on the CLINIC CALENDAR page of our website and send a clinic pack, consisting of Gretsch literature and door prizes. Invoicing: Gretsch will pay the Clinician his/her entire fee and then invoice the Host and co-sponsors for their contributions to be paid to Gretsch. Some co-sponsors may prefer to pay the Clinician their contributions directly; in which case, the Clinician is responsible for invoicing said co-sponsors in accordance with their individual policies. In order to receive Gretsch's portion of his/her fee, the Clinician must submit the Gretsch invoice within 60 days after completing the Festival/Event. Gretsch cannot book or contribute financially for other Clinician performances not considered Drum Clinics, such as Concerts, Gigs, Autograph Sessions and In-Store Appearances. Gretsch also cannot book or contribute financially to Band Clinics. We certainly recognize that a band or bass player can sometimes be a part of a Drum Clinic to help illustrate the lesson (how to play with a bass player, etc). However, the definition of a Drum Clinic for our purposes is clear and the overall premise must revolve around drum instruction. Band performances at a retail shop or school are not considered a Drum Clinic.